A confession: I’ve been bitten by the knitting bug. It started as a way to keep my hands busy on a long train journey (Worcestershire > Berlin and back). With a toddler in tow and several borders to cross, I didn’t want to be doing anything involving sharp needles or scissors. Secondly, toddlers quickly put a stop to anything that takes your attention away from them (goodbye reading, listening to music, watching films, doing anything on a computer or drinking your tea while it’s hot). My husband’s aunt can knit, watch TV and read a book all at the same time, so I was hoping to at least be able to talk to my two-year old about his Lego while I knit. So far, I can report that he seems very curious about knitting, loves talking to me about it and poking the needle into the ball of wool. Thirdly… I love knitwear. I wear a jumper almost every day from September until April. My favourite season is winter and I really enjoy the sensation of snuggling up in hats, scarves and mittens to go out in the cold. I gravitate towards knitwear in clothes shops (OK, this might be partly due to fitting issues with RTW woven garments) and I was secretly gutted when jackets and blazers replaced cardies and pashminas as the dressed-up cover up of choice. I’m a long way from knitting myself a jumper at the moment, but I thought I’d share a few of my beginner’s makes with you and hopefully you can point me towards some easy makes I could try next. A scarf for my son. 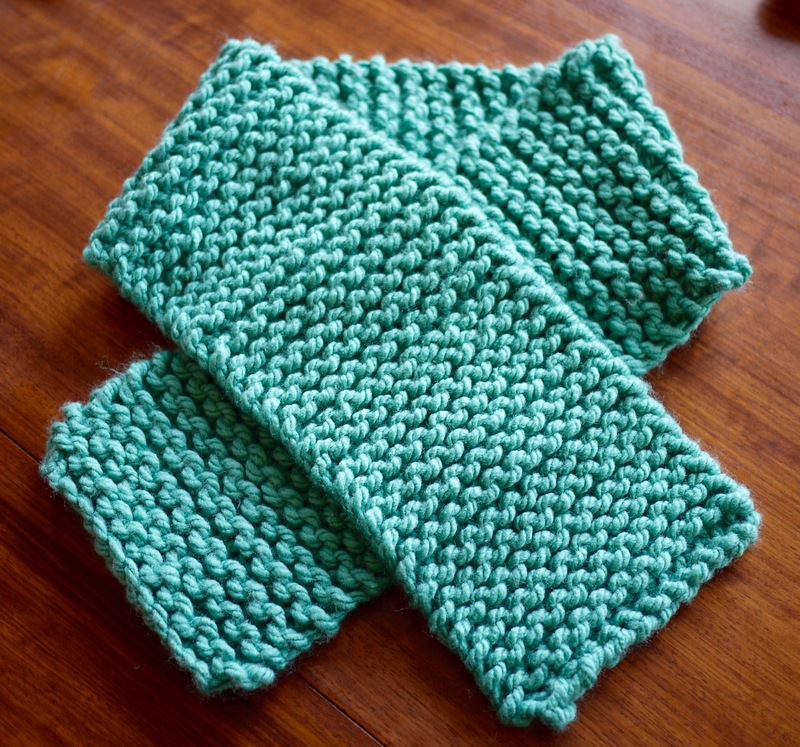 He chose the colour, and I went for a super bulky acrylic yarn that felt soft and would wash easily. It’s not been cold enough for him to wear it yet but he says he likes it! Baby booties. My sister’s expecting a baby at the moment and so I thought this would be a good gift for her. 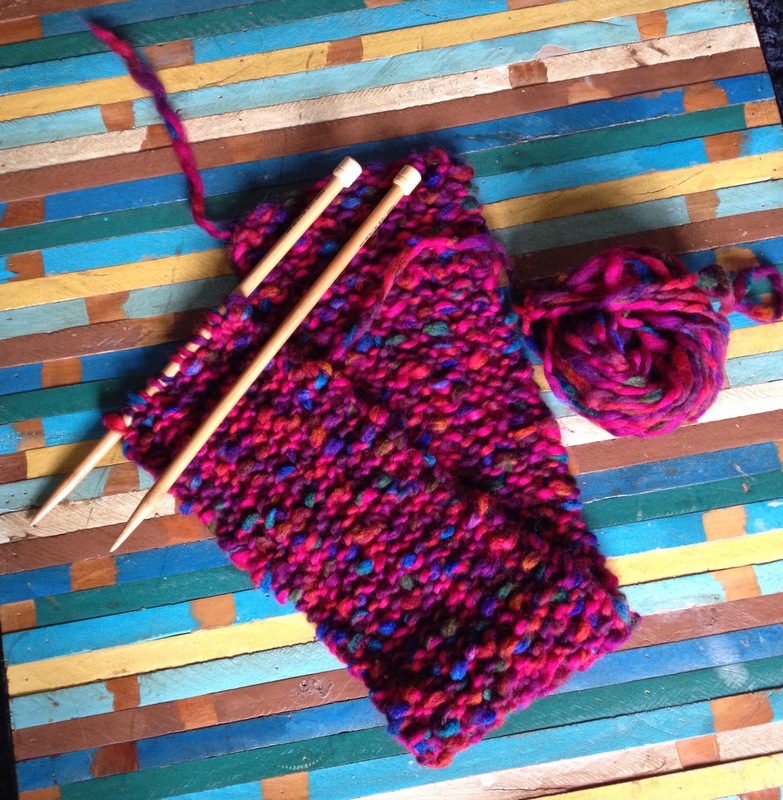 Double knit wool was a very different experience and I learnt to decrease. 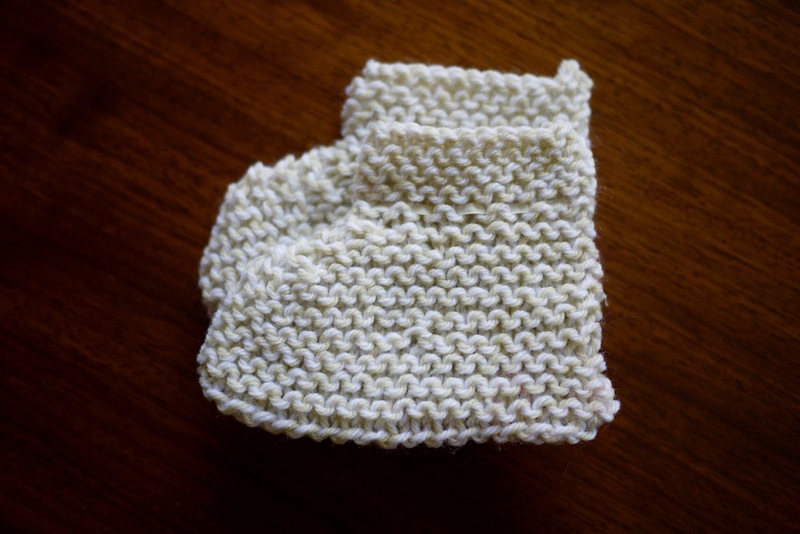 You can see here I’ve got the classic uneven tension that marks out beginner knitters – maybe the baby will have different sized feet to fit these unevenly sized booties? A hat for my nephew. Again, this is in double knit wool, and deliberately knitted on 5mm needles (at Aneeta’s suggestion) so that’s it’s stretchy. I need to work on my sewing up but I’m pretty pleased with this for a first effort at a rib stitch. I’m now trying another one in a pink aran wool for me. Sirdar acrylic double knit in lipstick, on 5mm needles. This picture makes the wool look almost radioactive – it’s actually much nicer in real life, I promise. 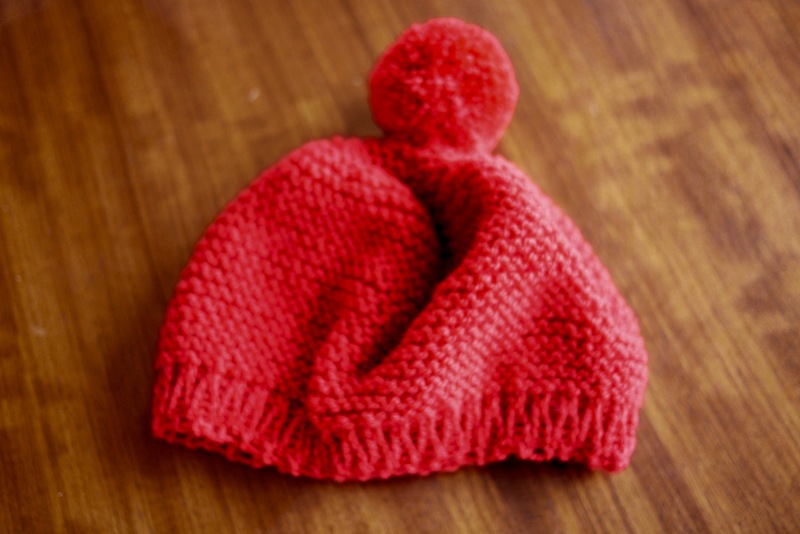 Things I’d like to learn soon: a different cast on to make the hat hem neater, how to correct mistakes, how to sew up neatly (I have this Craftsy class in my queue), and what all those different complicated looking needles are for – I’ve only used straight ones so far. I’m a bit overwhelmed by Ravelry at the moment – there’s just so much to look at and I get distracted by all the gorgeous pictures. What would you suggest I could try next?